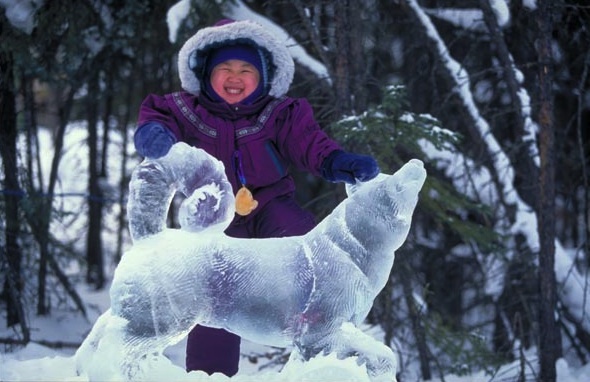 A child plays with an ice sculpture in Fairbanks. Photo courtesy of State of Alaska Tourism / Robin Hood. What better way to celebrate the magic of the holiday season than to visit the home of Santa Claus himself. Every year the city of North Pole, a 15-minute drive south from Fairbanks, hosts two festivals to celebrate the holiday season. Christmas In Ice and Winter Fest both kick off Saturday Dec. 3 and staying in modern comfort at the Fairbanks Princess Riverside Lodge is the best way to experience the events. Christmas in Ice begins with an ice art competition at the ice park, next to the Santa Claus house. The park displays dozens of Christmas-themed ice sculptures by local and international carvers. Stroll through a wonderland of glistening wreaths and larger-than-life gingerbread men and other themed sculptures. The kids’ park features four large ice slides, a life size ice maze – and for the littlest of the bunch – a couple small ice slides. Throughout the month of December, the Christmas in Ice festival hosts several family friendly events and culminates with the New Year’s Eve Snowflake Drop. The second day of events begins at 2 p.m. with a candle lighting at the North Pole High School auditorium. The celebration includes community awards and the crowning of the new North Pole king and queen. Festival attendees enjoy live entertainment, music and refreshments. The festivities wrap up in the evening with a Christmas tree lighting at 6 p.m. in the Santa Land RV Park. From the Princess family to yours, we wish you a happy holiday season.